I have never made a spring roll recipe at home. I enjoyed eating them at the restaurant but never dared to make them myself. I thought they were tough to make and required lots of preparation. I was wrong. Spring rolls are so easy to make! And if you involve all the family members you will cut the preparation by half and have a nice family activity. That’s what we did this weekend. We set out to make a spring recipe for kids, and what accomplishes that better than a recipe with spring right in the name? We wanted to welcome spring in a fun way. After all it was a very nice weekend in Montreal and we wanted to honor that. Spring is about flowers, colors and fresh fruits from our farmer’s market. So we decided to make fruit spring rolls. Nothing like fruits to refresh you and put a smile on your face. I decided to go with Mango as it is my daughter’s favourite fruit. Since it is the first time I make spring rolls at home, I wanted to make something with ingredients she already likes. Put the coconut milk in the freezer for 10 minutes. In the mean, prepare the spring rolls as the package directions. This is a delicate procedure so make sure it is done by the adult. 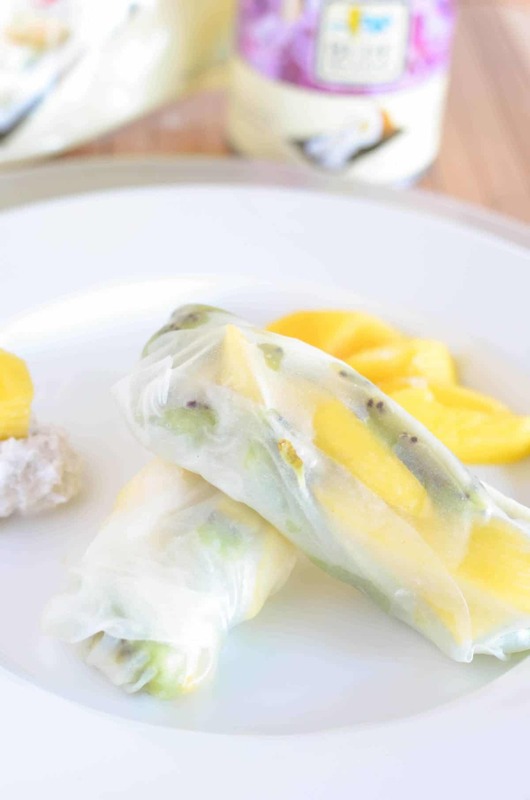 Let them fill the spring rolls with fruits. Make sure to supervise the folding. While they fill the wrappers, prepare the coconut cream. I was inspired by Jennifer from Mom Vs The Boys. Open the coconut milk can. Remove the top layer and put in a medium bowl. Add honey to the coconut milk and whisk until you get a nice and smooth cream. This was the most delectable snack ever. 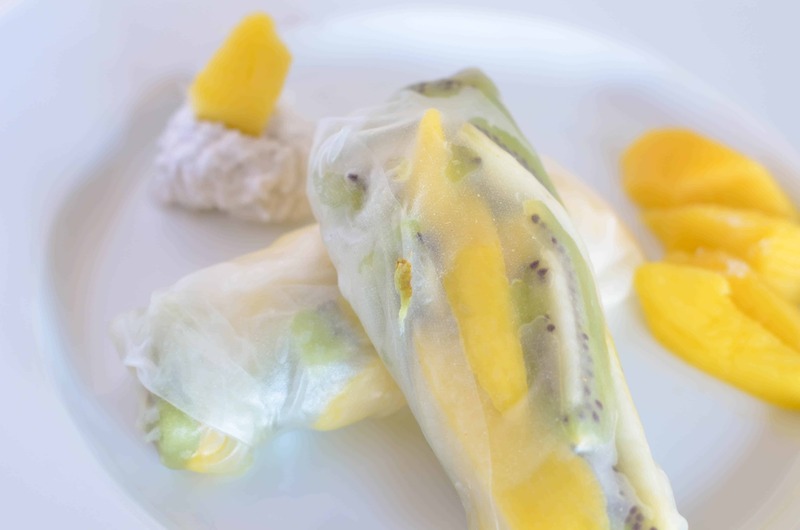 The mixture of spring rolls, mango, kiwi and coconut cream was truly amazing. All the family members enjoyed making the rolls and eating them in a coconut cream. I was not sure they would love the exotic flavor of the fruit but they did. They even took a spoon to eat the cream as is. Looking for more inspiration for spring recipes for kids with an East Made Easy twist? Check out the Blue Dragon website! Also, don’t miss their Tumblr, it’s filled with beautiful recipes and great cooking tips.Don’t forget to follow them on Twitter and Facebook. They share amazing ideas! Do you have a favorite spring recipe for kids? Share in the comments! Yummy.I can see why they are a hit with the kids. look so good. i would enjoy these! My kids would also! thanks for sharing the recipe! These look really good. Thanks for sharing. I think my family would like these. Yum, these sound delicious! I can’t wait to try making them myself. These look so good! I would love to make this for a BBQ! Mmm, mango….kiwi….yep, I’m sold! These look delicious! These mango rolls look so good. I imagine that they have fresh flavors that are perfect for the warm weather months. These sounds great, definitely something my family would like. Thanks for sharing the recipe. What a fun snack!! I love it. I’ve never thought to throw some fruit in a spring roll! I believe you that it’s great. It looks good through the screen!! This is my first to hear of them too. Wow that does look easy, I had no idea they were that easy either. I’ll have to try these sometime. Super cute idea for spring rolls. My kids would love these. very colorful too. These looks so good! I love mangoes and kiwi; YUM!! What an awesome idea! They look soo yummy and spring like! My kids love fruit and this sounds like a creative way to add a twist to fruit. I am going to try this very soon! It looks so good. I haven’t had vegetarian spring rolls. My kids would love these. Yum. I would never have thought to put mango and kiwi together. My kids would go crazy for these spring rolls. I have never heard of this before, but it really does look yummy! I know this would be a hit at my house! Love that it’s so light and healthy. These sound so good! My kids eat mangoes & kiwi all the time, but this would just make them feel like they were eating something new. What a great idea! I know my family would love these so I am going to make them. Mangoes and Kiwi are a favourite in my house. I have never heard of spring rolls with fruit inside. Now I am thinking of all the fruit combos that I like and wondering if they will work! Cute idea and great way to get fruit into your kids. What a cute way to incorporate spring into your activities with your family and to get something that is so delicious. This sounds great! I can honestly say that i would have never thought about these kind of spring rolls but this looks delicious. Thank you for sharing. I never even thought of making my own spring rolls. This sounds tasty. I never would have thought to try this combination!! I think its something my kids woudl like to eat! Huh. That looks weird… I might try that just to see. Yummy! I need to buy some egg roll wrappers to make these! What a great recipe. My kids would love this and mango is my favorite! I have never tried a spring roll before! I bed they taste amazing, I will for sure be trying out some Blue Dragon Foods! I love Blue Dragon foods! They have the best sauces and noodles! This is such a clever idea. This sounds like such a fresh, summery recipe. Now THIS is a spring roll I would actually want to eat. I’m not a big fan of oriental foods but this sounds yummy! What a unique snack! These are perfect for my family, especially since they have delicious fruit in them. I haven’t had kiwis in awhile, this is the perfect inspiration to start eating them again. Sounds delicious! My husband would love these! i am not a fan of spring rolls, but it looks good! These look really tasty. My kids love fresh and yummy food like this. These look super tasty! My little sister would absolutely love them, I will have to make them when she visits! I’ve never tried something like this before. I love mangoes though! This sounds good! Yum this sounds fantastic! My kids would love these too. I will have to most definitely try these! I have some kiwi and mango both that I need to use. This looks guilt free and absolutely delicious! That’s is such an interesting snack. I wonder if I’ll be able to get my picky kids to try it! Yes please. Those look delicious. A nice healthy snack for the whole family. Happy to inspire! This looks so fresh and sweet for summer! Oh wow, I’ve never had one with mango and kiwi! What an original recipe, but I’m intrigued, I must try this! Are you kidding me right now? THAT SOUNDS AMAZING! What a great treat for kids and adults alike. I didn’t even know Blue Dragon made all these products. Definitely will look for them. Oh my word!! This looks so yummy and easy – my two favorite things! My daughter and husband will LOVE this! What a fantastic idea. Yummm!! These sound delicious! My girls love these fruits and they’d have so much fun helping me make them too. Thanks for sharing! Those sound so amazing! This is the perfect snack for the coming warm weather. Thanks! Those sound awesome. I can see why they are such a hit with the kids.